Two solar-powered electric cars, designed by students from the Nanyang Technological University (NTU), were unveiled by the institution on Monday morning. According to Channel News Asia, one of the two is the first car in Singapore to be made with 3D-printed parts. Its cabin, which can seat one driver, is made of 150 3D-printed components that have been glued together using epoxy adhesive. “Using the latest engineering techniques learnt from their studies in NTU, the students have developed innovations such as silicon solar cells that can be contoured to follow the car’s shape,” he added. According to NTU, NV8 will participate in the Shell Eco-marathon Asia competition this year, under the Urban Concept category. Teams with more “roadworthy” fuel-efficient vehicles fall in this category, it said. The competition challenges students to design, build and drive a vehicle that can travel the furthest distance using the least amount of energy. 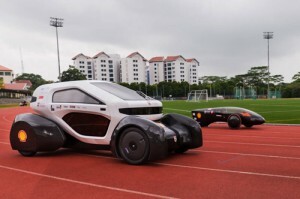 The students have also built the NTU Venture 9 (NV9), a three-wheeled racer, which can “take sharp corners with little loss in speed” due to its unique tilting ability inspired by motorcycle racing, the university said. The car, featuring hand-made silicon solar cells, will be NTU’s entry in the Prototype category at the Shell competition. Teams enter futuristic prototypes focused on maximising fuel efficiency through innovative design elements in the Prototype category. By developing the silicon solar cells innovation, Prof Ng said it allows for “maximum harvesting of the solar energy and a tilting mechanism” in NV9 that results in avoiding the loss of speed. The two NTU teams consist of 16 students from the various engineering schools. The cars were designed from scratch and students spent over a year to build them. Shell Eco-marathon Asia will take place in Manila from Feb 26 to Mar 1.